José Enrique Ramírez García (José Ramírez IV) was born in Madrid in May 1953. He entered the workshop in 1971, when he was 18, as an apprentice and in 1977 he reached the level of luthier first class. In 1988 he took charge of the management of the company together with his sister Amalia. One of the first things he did was to define the models they had been making up until then, as a result of changes in the taste for sound of some guitarists in the mid-80s. In 1979 he received some valuable recognition. Among various guitars he had chosen to take to the maestro Segovia was one he, José Ramírez, had made – two years after attaining the level of luthier first class in his father’s workshop. The fact that Segovia chose his guitar without knowing it had been made by him was a great surprise to him and very satisfying. Such was the happiness of the young guitar maker that he gave it to him as a present and enthusiastically wrote a dedication which he signed and glued in place next to the label. The maestro played this guitar in many of his concerts until the end of his life, as recorded in a letter the maestro wrote to the musician. In 1991 he continued working on a guitar which had the same sound characteristics as in the 1960s and called it the ‘Traditional Model’. He also started a project for a new guitar with a different design which gave a clearer and more direct sound which aligned with the new trends and which he called the ‘Special Model’ which was definitively finished in 1992. José Ramírez IV occupied himself with detailing, developing and perfecting his father’s models, adapting them to the current needs of the musicians. He also developed new construction techniques to make the instruments more comfortable and easier to play and more stable in their construction, in some cases avoiding, and in other cases reducing, the risk of deformities caused by movement of the wood. Another important chapter is that of the Studio guitars, aimed at beginners, students and musicians who wanted to amplify their instruments. We have to point out in José Ramírez I’s times these guitars were sold in guitar shops as alternatives to handmade instruments which were obviously more expensive and of a much higher quality. At the beginning he did not put his own label inside them but later realised his mistake because people came to him with complaints about guitars which hadn’t been sold in his shop but, because they had no label in them, he couldn’t counter the claims of the customers. Therefore he finally had some labels made which were totally different from those placed inside professional models, which solved the problem. 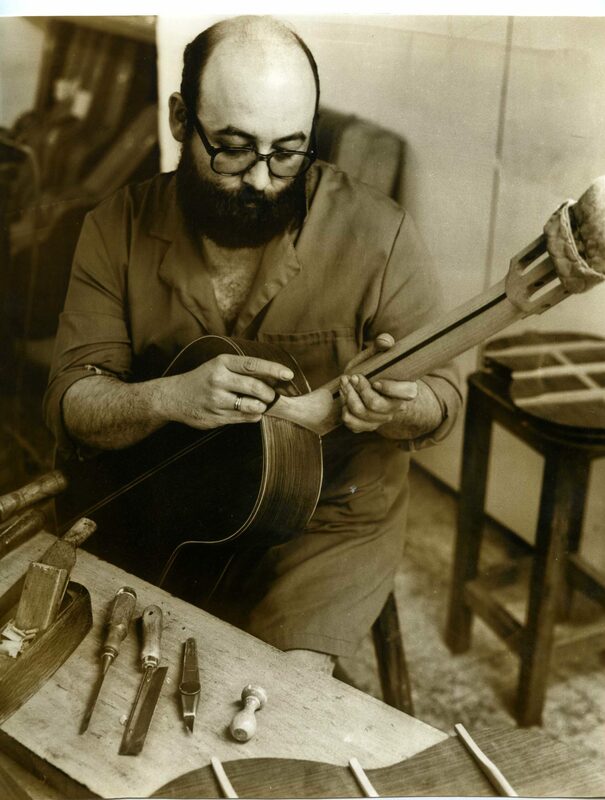 As for José Ramírez II, not only did he continue selling Studio guitars made in series, he also designed other models constructed by some of the best makers in the Valencia region at the time. José Ramírez III, like his grandfather, wasn’t a fan of studio guitars and therefore was not concerned with the gradual disappearance of his father’s designs. However, José Ramírez IV did not think this way. He was very conscious of the importance these guitars had as beginners, students and musicians who wanted an amplified guitar had a guarantee of quality backed by the House of Ramírez. His maxim was based on the fact that someone who was just beginning should not (and generally could not) start with a professional guitar so he had to think of an instrument which was reasonably priced, of good quality and pleasing to play. This line of instruments was very well received as a starting point and stepping stone towards a professional guitar. Musicians who need amplification when playing in a group would also find this a less risky option with one of these guitars than carrying out the same process on a handmade guitar. Thus in 1986 he convinced his father to design a range of studio guitars called ‘E’ with him, made exclusively for Ramirez with a special selection of woods. Later, in 1991, to coincide with the changes made to the handmade guitars, José Enrique designed another studio range, cheaper than the previous one and called it ‘R’, based on the template of the C86 professional model.